This simple diagram offers a visual that we hope will help you get your head around the enormous subject of mind over matter. The Persuading the Body series is an attempt to show that if we are to truly be masters of matter we must serve her first. We cannot be the master of anything, until we are also prepared to serve. To serve is the means by which we win respect and when we win the respect of matter we also win her heart then she will happily do our bidding. Not as a result of force but as a result of our love, co-operation and kind intent. 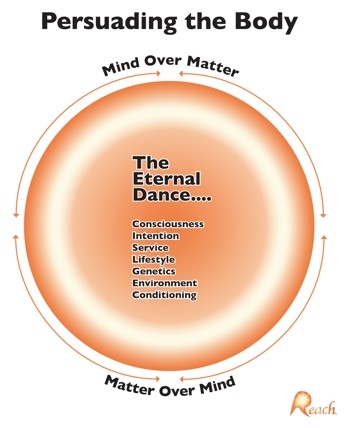 This diagram shows the eternal dance where consciousness and its allies and genetics and the other environmental influences come together to form what we call the eternal dance of life. The forces that drive the eternal dance (listed in the circle above) are extraordinaryily powerful in their own right but when they come together and co-operate through kind intention then life in all its splendour unfolds invitingly before us offering its rich inheritance; peace of mind, joy, stability and contentment.